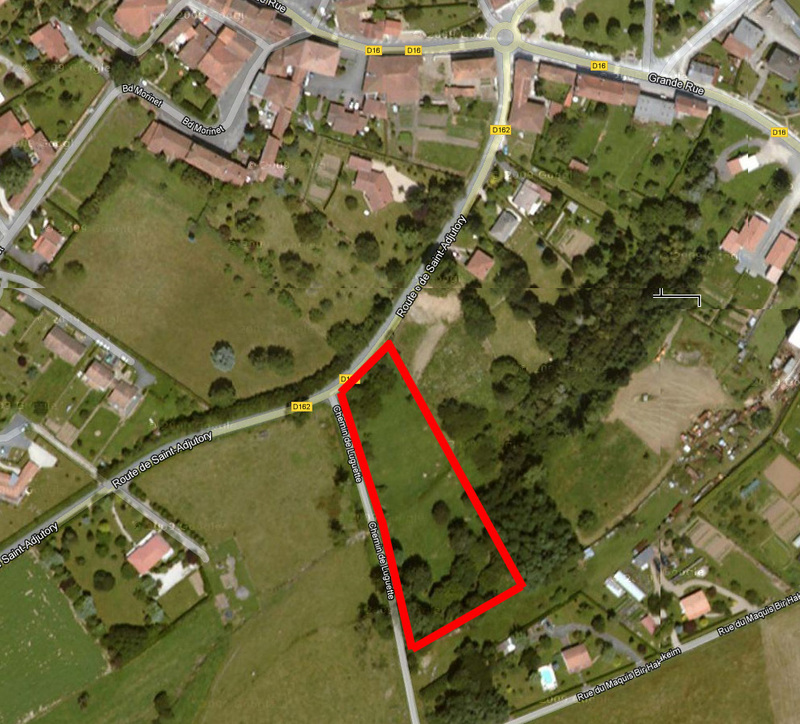 Initially we planned to make the sale conditional upon full “permit de construire.” In the end we decided upon a clause of “certificat d’urbanisme.” This will ensure that we have land with consent to build a house of up to 170 sq m. We will then apply for full “permit de construire” after the sale. This will give us more time to meet the planners, take our time to develop the design and submit the application. 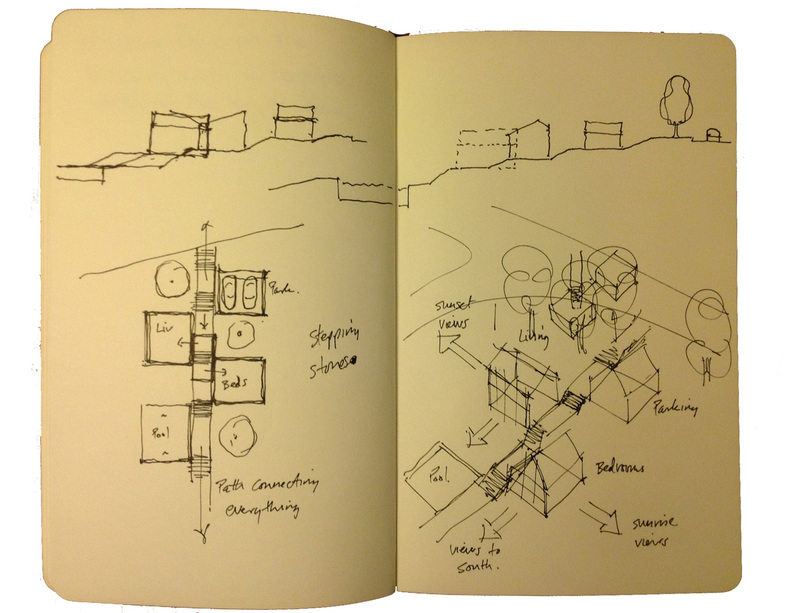 Nevertheless we started sketching ideas. When we there at easter, we took the opportunity to have an informal chat with the planning officer. Below are some of the sketches that we showed her. 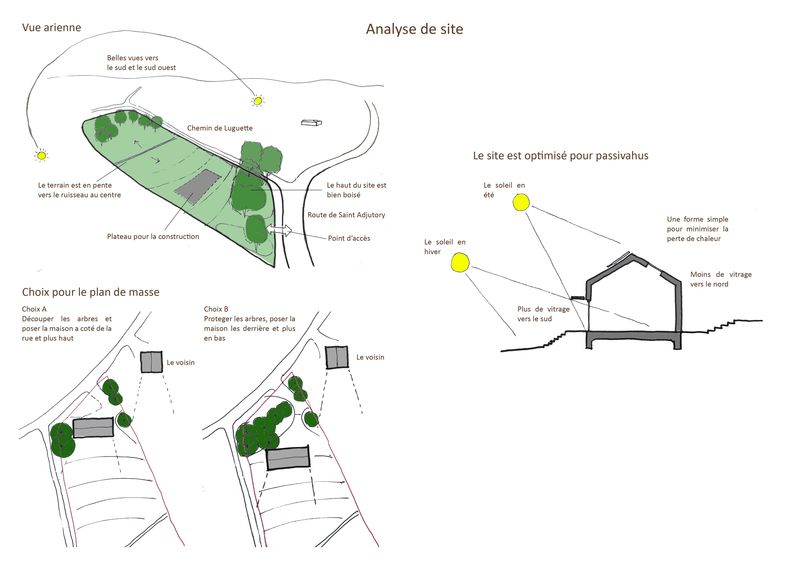 First of all, as any self respecting architect should do; some site analysis! 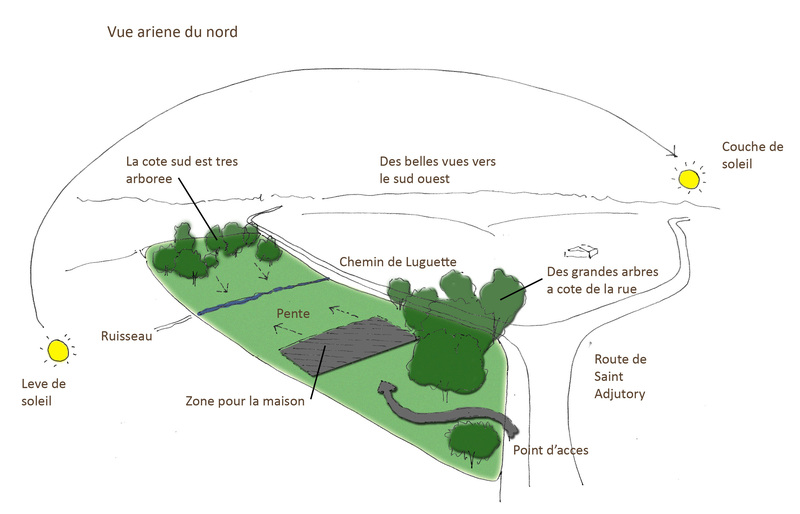 The site is on the southern side of Montemboeuf, and is accessed from Route de Saint Adjutory. It is steeply sloping from the northern adge down to the middle, then slopes back up again to the southern boundary. 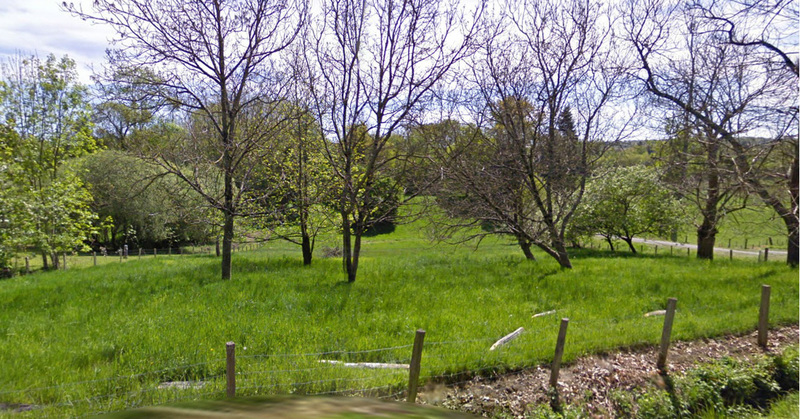 The northern and southern edges are heavily wooded and there are a few trees dotted along the western boundary. There is also a small stream running across the middle. From the northern edge of the plot the views to the south and the west are of far reaching rolling hills. The view from the south makes the plot look huge, which it is! All 7000 sq m! The building will be sited on the northern slope as high up as possible to take advantage of sunshine and views. It is also the side with utilities and drainage. 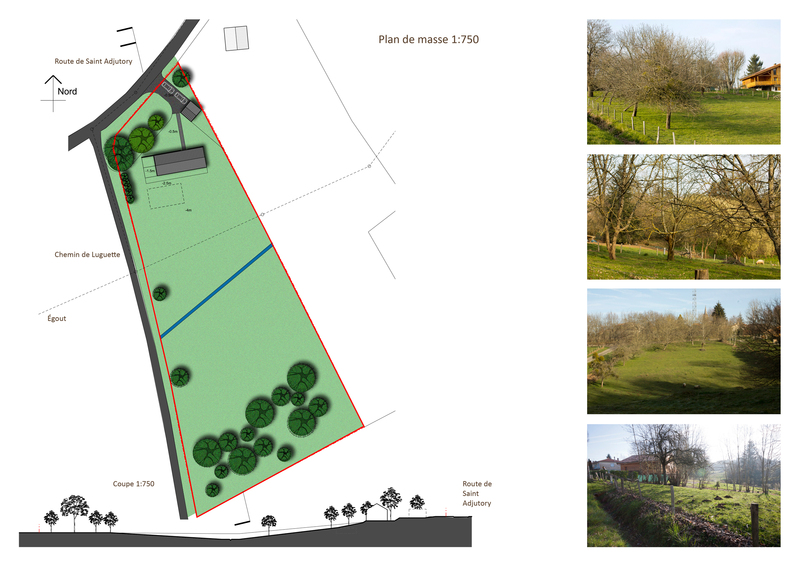 Vehicular access will be from Route de St Adjutory. 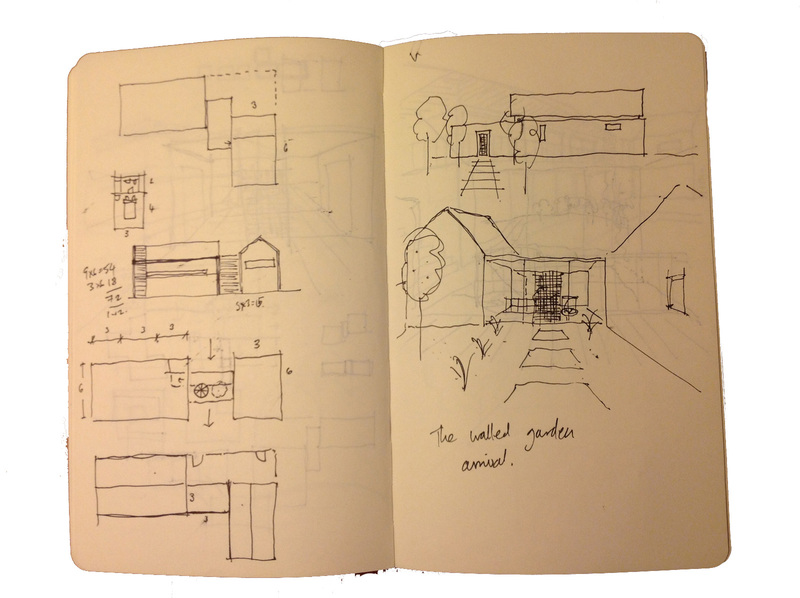 An initial sketch idea that we had, was to create a series of volumes that stepped down the hill framing little courtyards. The house would be two of these volumes connected by an entrance lobby that led you through to the garden. We also liked the idea that you approach the house from wooded surroundings, and the entrance is quite simple, almost hidden. We thought about entering through a walled garden or courtyard. 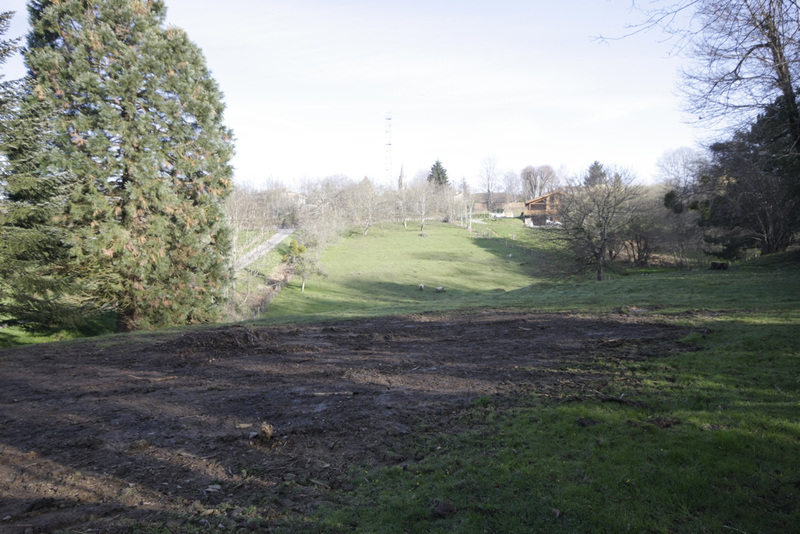 The car parking covered and possibly a garage or outbuilding which will help to define the courtyard. 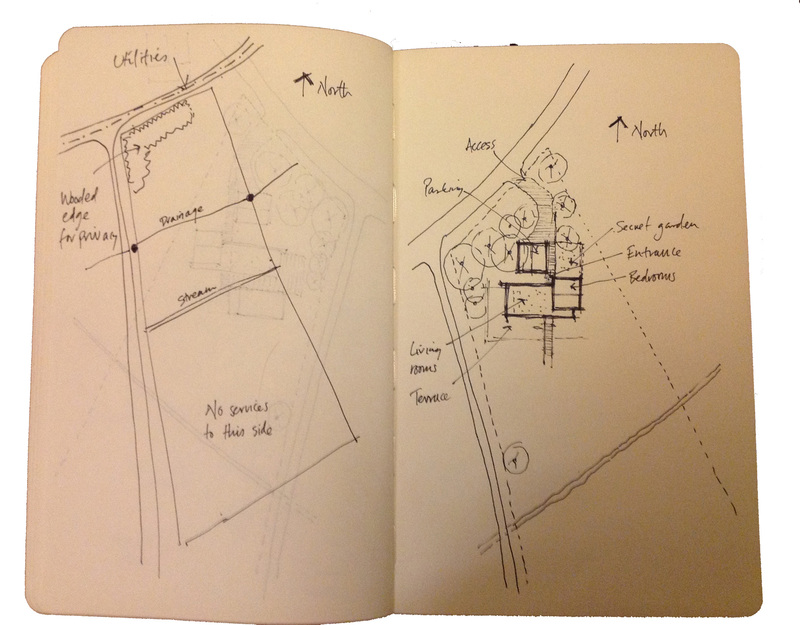 We simplified the idea slightly, with just one courtyard. The house itself is split into two volumes (sleeping and eating) either side of an entrance lobby. Once inside the lobby the view will be framed by glazed doors which lead you through to the garden. The living volume will be one storey with a flat living roof, and the sleeping volume will be two storeys with a pitched roof. 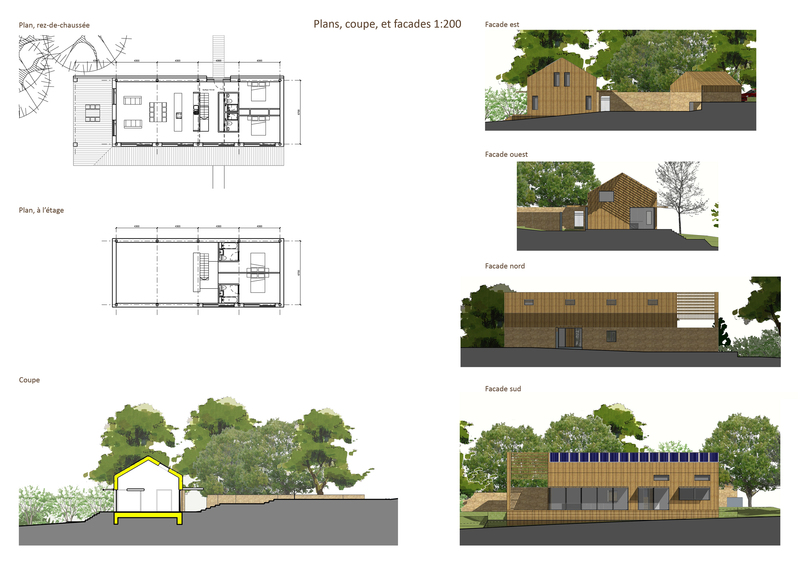 I also talked about a passion for low energy design, passivhaus principles, and building with local and natural materials. This all went down well with the planners thankfully! Despite her admission of preferring traditional architecture, she thought the design was original and they are very open to this kind of approach, phew! She suggested that we arrange a second meeting with her and her colleague (the design officer) once we have got the designs a bit more worked up. 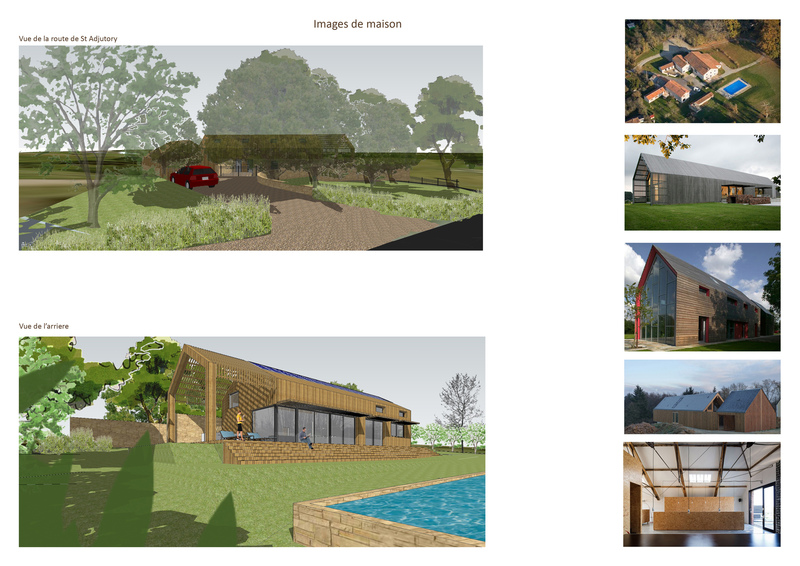 Ahead of the meeting with the planners on the 5th September, we have developed the design a bit. It is a similar layout, but now within one ‘barn’ style volume. It simplifies the form, but also allows for a large double height volume in the lounge, with opportunities for mezzanines etc. 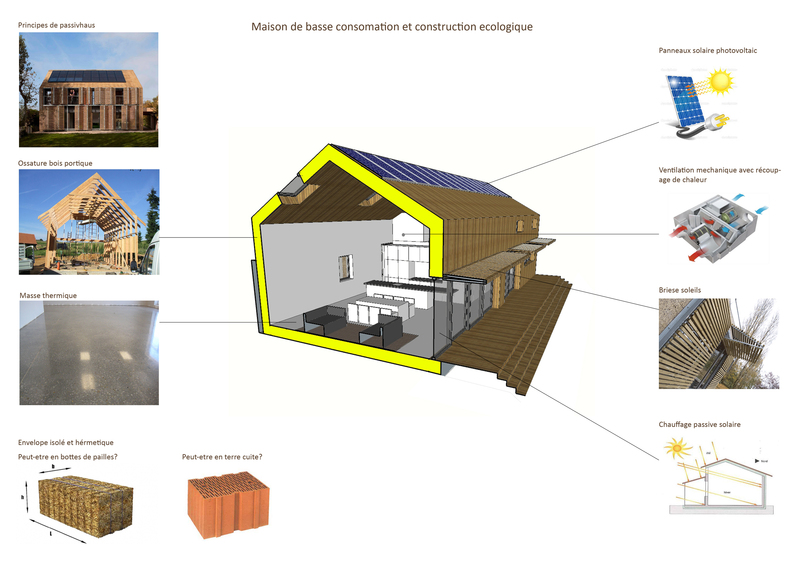 We are giving some serious thought to straw bale construction too! We have found ourselves a talented young landscape architect, who also happens to be a family member! His sketches can be found on our Landscaping page. This is so great! I will be following the progress eagerly. I want a secret garden too! All good thanks… not long to go now! Looking forward to seeing you both and hearing more about your new project! Thanks for your message. We saw Richard at the weekend and he told us a little about your place, it sounds wonderful. Although the builder doing our ground works is originally from Yorkshire, the main builder is French and we hope to use French artisans for everything else. Keep your fingers crossed for us, we start very soon.